Join our team in 2019 by taking part in the CSA Workshare Program! 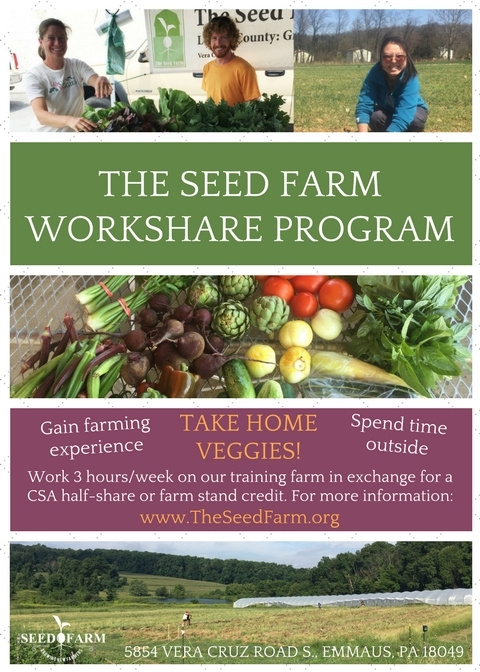 In exchange for working 3-4 hours per week between June and October, you will earn one weekly CSA half-share. Expect to help with planting, weeding, harvesting, washing vegetables and totes; plus an assortment of other farm jobs. Be prepared to work outside in the sun or rain, where you'll be on your feet for hours at a time. Many jobs require bending over, kneeling, squatting, or lifting loads of 25+ lbs. People who have physical limitations are welcomed to apply - we still have some tasks that are just right for you! You'll need to be dressed appropriately for the weather and supply your own water bottles, sunscreen, hat, sunglasses, rain gear, and footwear. Students, teachers, and others who are only available through August: please apply for the time that you have available! If you are interested in joining the 2019 Workshare Program, please click here to apply. Applications are accepted on a rolling basis. The workshare season will begin the week of June 17, 2019. *If you are not available regularly or during these shifts, please consider signing up to be a Seed Farm volunteer! Please email Lindsey Parks, Executive Director, with questions.